Despite this being one of the longest names in foundation history, I decided to give this newly reformulated product a try – along with the concealer. 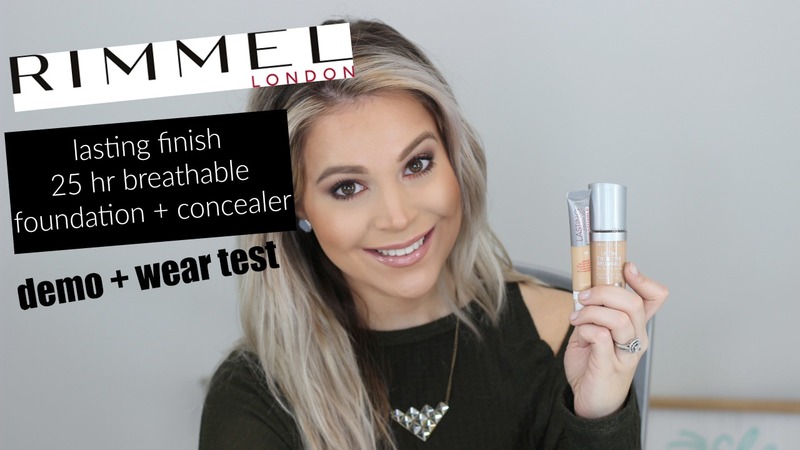 After I saw one of my favorite beauty bloggers really like the concealer particularly, it totally intrigued me, so let’s see if I felt the same in my Rimmel Lasting Finish 25hr Breathable Foundation and Concealer review/wear test. I feel like there are so many women who LOVE Rimmel makeup for its affordability and mostly consistent performance. From their eyeliners to their powders and bronzers, and even lip products… out of the drugstore… Rimmel is one that many adore. So when they reformulated this favorite foundation, I definitely was a bit curious. At $6.99 for the foundation and $4.99 for the concealer, it certainly is worth trying out! The formula promises lightweight, long-lasting, medium buildable coverage, SPF 18. Overall, this one did not totally disappoint! I disagree that the coverage is medium… I’d say more light/medium. The concealer applicator is a bit of a miss, but it’s workable especially for the price. I personally like this formula better than the Physician’s Formula Healthy Skin, so there’s that. Let me know if you’ve tried this foundation and if you haven’t already, please consider subscribing to my YouTube channel to get the latest videos (I’ve been posting weekly).